The Pro Hunter MAXX is engineered to keep you steady under pressure while reducing vibration. Its patented design delivers maximum moment of inertia, providing greater shot control and the confidence you need to drive your arrow home. The Pro Hunter MAXX is based around a high modulus carbon rod providing ultra-stiff construction. The Pro Hunter MAXX features 3 independently removable end weights for customized balance and performance. Sims Internal Harmonic Dampener and De-resonator perform dou.. This season, take your shooting to the Xtreme! The Sport Hunter Xtreme was engineered to help provide superior stabilization while conquering shot-induced vibration, resulting in the ultimate hunting stabilizer. The Sims Internal Harmonic Dampener and De-Resonator combine to effectively minimize vibration transferred from the riser to the stabilizer upon release of the arrow. The individual 1 oz. 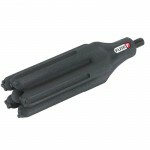 end-weights allow users to customize their stabilizer to meet the ideal balance requirements of thei.. 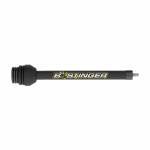 The elastomeric FUSE Enduro is small in stature but engineered for big-time results, Enduro's custom tuning fork design shatters noise and vibration. Lightweight and fits any budget. 5.25in. 5.4oz. .. 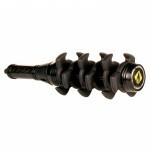 The APACHE STABILIZER features proprietary dampening materials to snuff out vibration and silence your bow at the shot. For added versatility the 8" stabilizer system comes with a 5" base stabilizer and a removable 3" long 2 oz carbon fiber accessory bar to help balance out your bow. 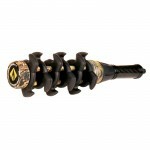 The new APACHE STABILIZER is available in black and Realtree APG camo. .. Introducing the Balance X, easily the most advanced and adjustable stabilizer on the market today. Our dampening material will neutralize vibration for a noticeably smoother shot. With a fully customizable length of 7 to 11 inches, you can choose the length and weight that is right for your bow setup. ..
QD TWIST-LOCK for quick/easy removal (patent pending). TRI-FOIL shape for optimal rigidity. TRU-TOUCH soft-feel technical coating. Performance-based composites for vibration/sound reduction. Improves bow balance and stability. Engineered for performance bows. Available in licensed camo patterns. Fits all bows. Length is 7.8". Weighs approximately 4.8 oz. ..
Limbsaver pack combo consists of Standard 4.5 inch S-Coil stabilizer a pair of Ultra Quads and a pair of Super String Leeches. 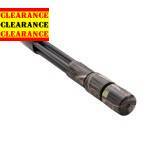 * Reduces bow vibration * Fits most bows with universal mounting * Silences bow after shot * Color: Black .. When it comes to vibration dampening and performance-boosting stabilizers, the LS Hunter is top of its class. The sleek, carbon fiber frame is packed full of vibration dampening technology designed to knock out noise and hand shock. The removable Broadband node neutralizes vibration, helps to reduce bow jump and improve your bow's balance. Consider vibration, noise and hand shock a thing of the past with the new LS Hunter Stabilizer! The LS Hunter is 9.5″ in length and weighs 6.2 oz. .. 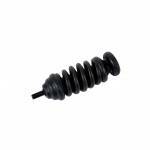 The S-Coil Stabilizer is made of the Navcom material for effective noise and vibration control. Available in 4.5" with a weight of 4.9oz black in color. ..
Limbsaver pack combo consists of Standard 4.5 inch S-Coil stabilizer a pair of Ultra Quads and a pair of Super String Leeches. 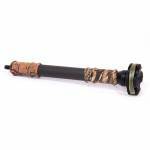 * Reduces bow vibration * Fits most bows with universal mounting * Silences bow after shot * Color: Camo .. The Chubby line of stabilizers are perfect for the Bowhunter looking for Vibration Dampening with the combination of the Doinker Supreme and the all new Gen 5 Doinker with stability in a compact size. 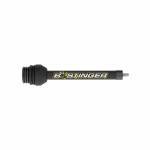 ..
Doinker Multi-Rod Hunter Plus This Doinker Multi-Rod Hunter Plus Stabilizer is super-rigid and carbon-powered to improve your hunt. 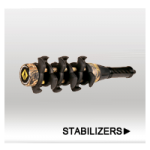 The Multi-Rod Stabilizer combines longitudinal support with patented Doinker 360-degree active vibration dampening. 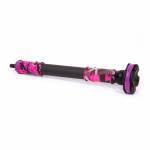 This Multi-Rod stabilizer offers unparalleled performance. .. 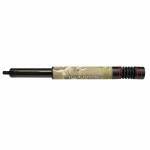 The APACHE STABILIZER features proprietary dampening materials to snuff out vibration and silence your bow at the shot. For added versatility the 8" stabilizer system comes with a 5" base stabilizer and a removable 3" long 2 oz carbon fiber accessory bar to help balance out your bow. 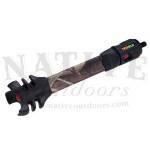 The APACHE STABILIZER is available in black and Realtree APG camo. ..